And its flowers are pretty as well! 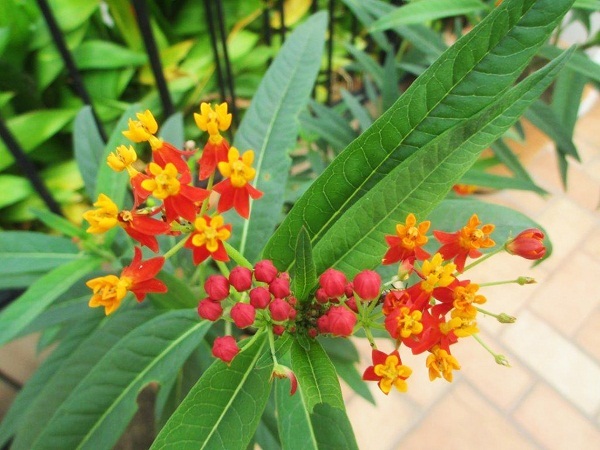 Indeed the Asclepias curassavica seems to meet many of the needs of our flutterby friends – attractive, multi-colored flowers with delicious nectar upon which to lap for the magnificent adults and tender leaves fairly crying to be devoured by young caterpillars. A smallish, perennial, herbaceous shrub found naturally along roadsides and in pastures, from sea level to over 6,500 feet (2,000 meters) it grows throughout the American tropics and sub tropics. Its reddish orange and yellow flowers are a regular visitation site for all manner of butterflies, bees, wasps, flies, beetles and crazy plant people like me! But back to those beauties of the Lepidoptera family – Monarch Butterflies – with this interesting nugget of knowledge. Ever wonder why birds don’t like to eat their caterpillars? Well, in the white sap of the Mexican milkweed is the toxin cardenolide glycosides. 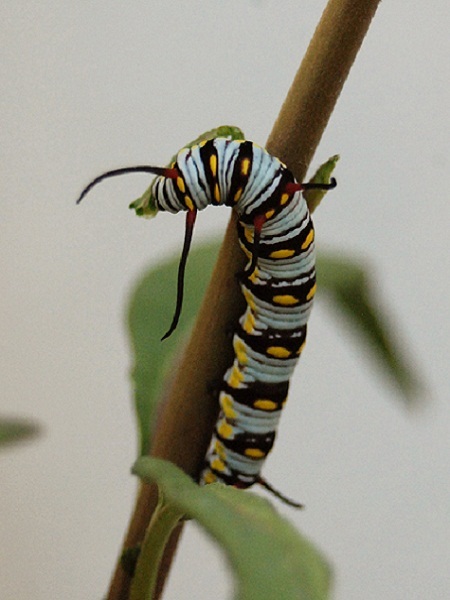 And when those brightly colored yellow, black and cream-white caterpillars consume the milkweed leaves, their systems gain the poisonous qualities which protects them from most predators. In fact, after they metamorphose, the adults retain that toxic taste. It has been observed that birds eating Monarch Butterflies vomit shortly after ingesting them. Returning to the primary topic of discussion – there is a problem or two or three with the appearance of Mexican Milkweed. The first of these can be aphids. Actually, while unsightly, they generally do not impair the plant’s blooming or its growth and some folks even feel that they add to its beauty and interest of the plant. However if they are numerous, their “honeydew” (clear liquid excrement) may stimulate the growth of sooty mold, which might inhibit your plant’s photosynthetic activity a bit. But these characters can be controlled by simply spraying the plants with a burst of water which will dislodge them – though this process may have to be repeated throughout the season. The second (rare though it be) could be orange and black milkweed bugs that eat the seeds and tissue of the milkweed plants. These nasties are one of the few insects that can tolerate the Mexican Milkweed’s toxicity. The last issue is directly related to the very reason most folks grow the Asclepias curassavica … the plant’s defoliation caused by butterfly (generally Monarch and/or Queen) caterpillars. Once your plants are defoliated – or the caterpillars have moved on – merely cut back the stems and it will, in a fairly fast fashion, resprout. It will soon rebloom, repeating the cycle of flowers to seeds which – in the form of white, fluffy “parachutes” with the seeds attached to thin bunches of hair-like threads – are dispersed by the slightest breeze. Mexican Milkweed will grow to somewhere between 36 to 48 inches (91.5 – 122 cm) and likes regular waterings (but don’t over water) in sun to partial shade. In that they can grow a bit tall, you may want to plant them in the middle of any groupings or toward the back so that they don’t block shorter species. An obvious alternative is to pinch back the plant in the spring to cause more branching and increase bushiness. With their deep fleshy, tap root, larger Mexican Milkweed plants are rather difficult to transplant. So then, how should one start? Perhaps one of two ways – their seeds can be planted directly in your garden beds or started in flats. In the latter case, germination rates are generally higher and, as it is easier to establish your milkweeds with transplanted, well-rooted seedlings, this might be a good way to proceed. 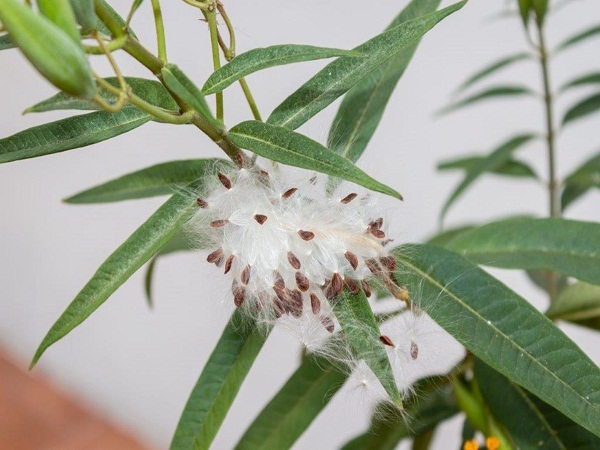 Should you wish to harvest and store milkweed seeds for later use here are several tips that will increase your chances of success: The best to collect are those that are within a day or two of opening. (If, upon squeezing the pods, they don’t open easily, then they usually do not contain mature brown seeds. Seeds well into the process of browning and hardening will germinate best when planted the next season.) Remove the coma, or silk-like ballooning material, from around the seeds. Store dried seeds in a cool, dry place protected from mice and insects – a reclosable plastic bag in the refrigerator works well too.